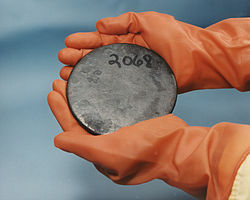 Uranium he yit-chúng fa-ho̍k ngièn-su, fa-ho̍k fù-ho vì U, ngièn-chṳ́ su-muk he 92. ↑ Morss, L.R. ; Edelstein, N.M. and Fuger, J., pian. (2006). The Chemistry of the Actinide and Transactinide Elements (3rd pán.). Netherlands: Springer. ISBN 9048131464. Liá-chak ya̍p-mien chui-khiûn siû-thin yî 7 Liuk-ngie̍t 2018 16:00.